As a member of the gourd family, butternut squash is technically a fruit because it contains seeds. There's another fun fact to file away in your mental archives or share at your next dinner party, because doesn't everyone want to know these things? Whatever it is, I call it delicious. I find butternut squash is a good gateway to the world of winter squash. It's just got an inherently appealing flavor that's nutty and sweet. It's crazy easy to prepare and you can do a ton with it. I think of it as my go-to vegetable I mean fruit for fall. For this recipe I decided to give things a bit of a fresh pop by using raw, fresh herbs as well as a spicy kick by using a raw, hot cayenne pepper. I wasn't in the mood for meat so to give the meal some heft I threw in some quinoa (the last of my homegrown batch). It was enough food for the two of us for dinner, with enough leftovers for a light lunch. I figure as a side dish it would feed 4 people. In a large bowl toss together 1 tablespoon of olive oil with the diced butternut squash. Season with salt and pepper to taste. Spread the coated butternut squash out onto the lined baking sheet. Bake in the oven for approximately 30-40 minutes. In the meantime, cook the quinoa according to package instructions. Once cooked, set aside. In a food processor, toss in basil, parsley, cayenne pepper, and garlic. Pulse to finely chop and mix together the ingredients. Squeeze in the lemon juice. Then, with the food processor on, stream in the remaining 2 Tablespoons of olive oil. The result will look like a paste. Scrape the herb mixture into a small bowl and season with salt and pepper to taste. Set aside. Once the butternut squash pieces are fork tender and slightly crisp around the edges remove from the oven. 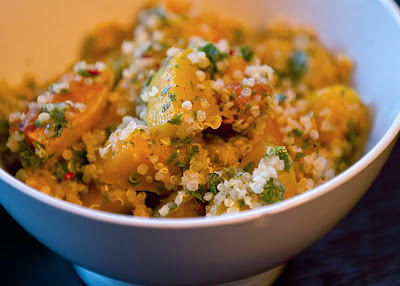 Add the cooked butternut squash and cooked quinoa to a large bowl. Stir in the herb paste. Yum this sounds and looks delicious. And yes, I Googled the question 'is butternut squash a fruit' because I was skeptical. Someone how I like it even more now! Do you have any tips for peeling a butternut squash? 1. Cut one inch from the top and bottom of the squash, and throw out. 2. Cut the squash in half where the thinner end begins to widen around the middle. 3. 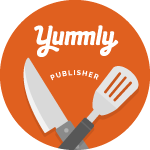 Turn each half so that a flat end rests against the cutting board. Use a sharp serrated peeler to peel off the skin in downward strokes. 4. Once both halves are peeled, slice the fatter half lengthwise. Scoop out the seeds and membrane. 5. Cut the flesh according to the recipe. This looks like a great fall recipe- I love butternut squash and I love the kick from the cayenne- do you think it would work with frozen, mashed butternut squash? Well, you can totally use frozen pre-cut squash chunks. As for mashed, you obviously won't be able to roast it, but the flavor combo still totally works. 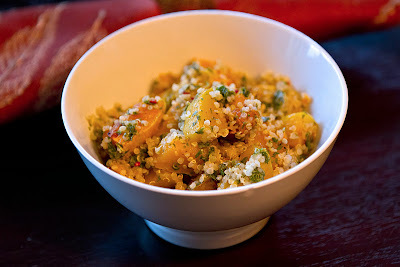 I figure just heat the mashed squash and stir in the herbs and use it as a "sauce" for the quinoa.